Hello. So I am having a small issue with birthdays and my calendar. So I input birthdays into some contacts so they show up on my calendar as normal. But I deleted the occurrence so it wouldn't show up any more. Well now I want them back and to show up on my calendar again. But I don't see any way to do that. Even if I delete the birthday then re add it on the same contact it won't show up. If you know how to get that to happen? Any help would be appreciated I have a Bold 9900 on OS 7.1. This conversation continued over several emails. Click on the break to see what transpired! At first I provided George with a work around after duplicating his issue on three devices in my possession (BlackBerry Bold 9700 and Torch 9800 running OS6, and a BlackBerry Bold 9900 running OS7.1). I know this must be frustrating and I was able to recreate this issue on my BlackBerry Bold 9900. While I do not have an answer as to why this occurs, I have come up with a work around that should help you with this problem and get your birthdays appearing again. If you go back into your calendar you should see them appear again as a notification. Please let me know if this works. However, this did not work for him. We tried seeing if the entries were set for midnight or if he had multiple calendars/emails on his device. As birthdays would be added to the default calendar I directed him towards the 101 on setting the default calendar. Then, I asked him to go into his calendar and see if "show all calendars" was selected in case the birthdays were being saved to one not being viewed. I also advised him that he could temporarily use the Tasks application for the missing birthdays as deleting the birthday field and adding it back did not work. Unfortunately, all of his accounts appeared in the calendar and he still could not get the yearly occurrence to show up again in his calendar unless it was done manually. George had also been in contact with his service provider and BlackBerry support, and we all advised him to redo or upgrade the OS. After performing that action, a new problem popped up. Now when he adds birthdays to a new contact the notifications appear in his calendar but not when editing an existing contact. We have had several exchanges back and forth and I could not recreate the issue or solve it. He did hear back from technical support who advised that it was an OS glitch. I searched high and low to try and find an answer as to why new contacts worked and existing contacts did not. Keep in mind this is only when entering in birthdays in the contacts application. Normally when you enter it there it automatically sets up a notification in your calendar. So now I'm asking you faithful readers to try and help a fellow CrackBerry addict with this issue and to see if it can be resolved or if it really is a software glitch! Have a question about BlackBerry etiquette? Need advice on how to cope with your BlackBerry addiction? 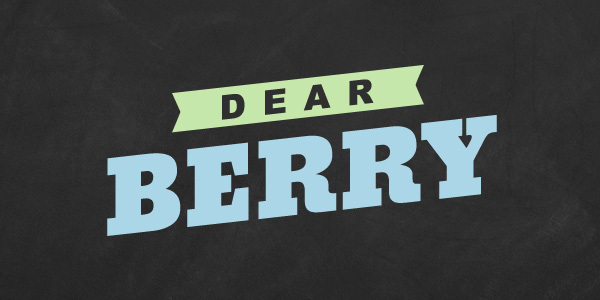 Dear Berry has you covered and there's no question too big or problem too small. Submit any of your BlackBerry woes by email to dearberry@crackberry.com or on Twitter @DearBerryCB.